I think beets are underrated and deserve more credit. They are root vegetables harvested all through summer and late fall. Don’t throw away the leaves! You can throw them in a salad or smoothie to mix up your greens. Beets are delicious, nutritious and store very well. You can actually keep them for months! Just remember when you have eaten them, so you don’t think you have blood in your stool the next day. 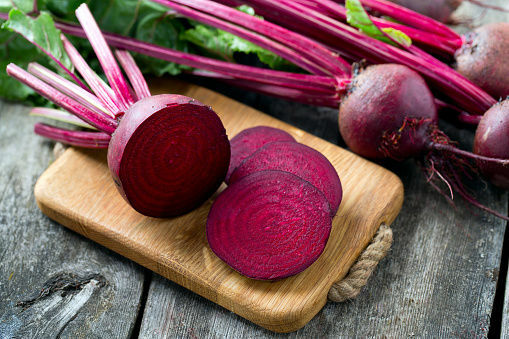 Beets may give your stool (and urine) a reddish color. There are several types of beets, from the red to the golden. One fun fact about beets is during the middle of the 19th century wine was often colored with beet juice! This may sound strange, but beets are very sweet like a lot of wines. Let’s look at some of the reasons why you should consider making this often forgotten vegetable a part of your daily diet. Just one cup of beets contains 31 mg of magnesium. Some evidence suggests magnesium may reduce the overall risk of cancer. In one study, researchers found the group with the highest magnesium intake seemed to have the lowest overall cancer risk, while the lowest magnesium level group carried a higher risk. Another study examined different levels of magnesium intake in colon cancer patients compared to cancer-free patients. The lowest risk for colon cancer was observed with high-magnesium intake, while low-magnesium intake was associated with higher colon cancer risk. This equals a risk reduction of 24 percent for colon cancer and 18 percent for rectal. One cup of beets also has 22 mg of calcium. Adequate calcium may also decrease your risk for colorectal cancer. Recent studies confirm high calcium intake is associated with a lower risk of colorectal cancer among both men and women. Maintaining the correct levels of calcium in your system may also reduce your risk for breast cancer. According to a Harvard Medical School study, beets may help lower blood pressure. “Beets contain naturally high levels of nitrates, which your digestive system converts into nitric oxide. This compound relaxes and widens blood vessels, which, in turn, lowers blood pressure,” Harvard says. In the study, 68 people with high blood pressure were randomly assigned to drink about a cup of regular beet juice or a nitrate-free beet juice (the placebo) every day for four weeks. Blood pressure readings fell by an average of 7.7/2.4 points in the people who drank regular beet juice, compared with no blood pressure changes in those in the placebo group. The magnesium in beets may also help lower blood pressure. This mineral is widely regarded for its muscle-relaxing properties, which may help people with high blood pressure. A review of 22 studies about magnesium and hypertension showed a 3-4 mm Hg reduction of systolic blood pressure and 2-3 mm Hg reduction of diastolic blood pressure. Beets have the highest sugar content of all vegetable, 9.19 g of sugar in one cup. You have to be mindful of this and watch your daily sugar intake, but it may be better to satisfy your sweet tooth with a natural sugar as opposed to refined sugars and processed foods. I love to throw a few beets in my morning smoothies to sweeten them up a bit. I find when I stick to natural sugar from fruits and vegetables, I crave less of the fake stuff that is abundantly supplied in the aisles of our grocery stores. Beets are also great when used as an ingredient for desserts. Along with sweetness, they add moisture, which provides an alternative to oil and butter. For dessert recipes that use beets, click here. Beets contain pectin, a type of fiber that helps remove toxins from the liver and generates new liver cells. One cup of beets also has 442 mg of the mineral potassium. There’s a surprising connection with the liver and potassium. Liver injury or infection causes patients to urinate their potassium out. When the liver heals, the potassium levels start to go back up. This has implications for people with chronic liver problems, in terms of both diet as well as use of medications, since very low potassium levels can be more dangerous than the liver problem alone. There are 22 mg of calcium and 54 mg of phosphorus in one cup of beets. Most people know calcium is critical for strong bones and teeth, but what you may not know is phosphorus works with calcium to build strong bones and teeth. In addition to this, phosphorus is a key ingredient in the recipe for energy-producing ATP (adenosine triphosphate) in your cells, which means this mineral is important for how your body stores and uses energy. Phosphorus is also needed to make proteins, like the one responsible for the oxygen-carrying capabilities of our red blood cells, and it is needed to repair cells. For the full nutritional value information about beets, click here. And let’s face it, sometimes you may not be able to have beets as often as you would like. If you are lacking some of those critical nutrients that beets provide, Proactive Health Labs recently joined forces with Metagenics to help make sure that if you are going to supplement you are doing it with products you can trust. You can visit here http://phlabs.metagenics.com/store. A percent of your purchase will be offered as a donation to help provide everyone access to credible preventive health information.